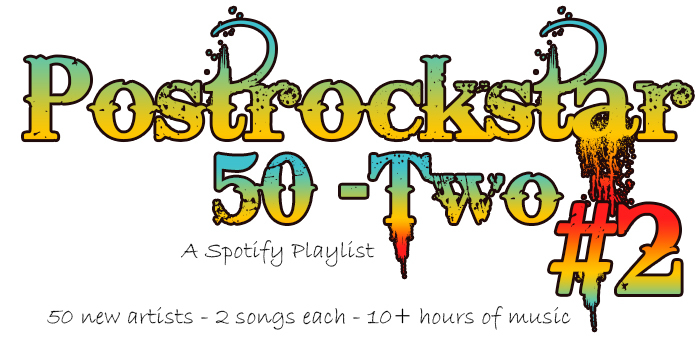 By popular demand: Postrockstar 50-two #2 – A spotify playlist series! 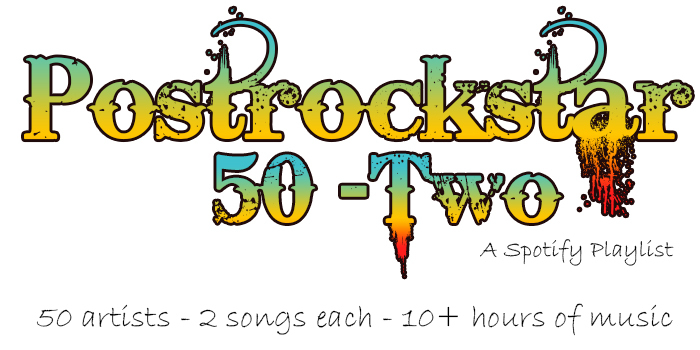 Because we had such a warm response to our first playlist, James has gone ahead and created a follow-up playlist in what will now be a likely ongoing series entitled Postrockstar 50-Two. This playlist features two songs from 50 different post-rock artists and is over an hour of excellent musical goodness. This time around we’ve gone with a heavier theme, crossing into the boundaries of post-metal. Next month our third incarnation of 50-Two will be a much more ambient group of artists. So sit back, put on some good headphones, click the banner above and enjoy! Today we have a very special treat for our readers. James has finished work on a playlist entitled “50-Two”, which contains 100 tracks from 50 of his personal favorite Post-rock & Ambient artists. If you are unfamiliar with Spotify it is completely free to try. If you are familiar with it, simply click the banner at the top to start enjoying this excellent compilation featuring a well rounded selection of artists. Kapiller Ferenc, who you may know as the mastermind behind the solo project Rain Catalogue, has released the first song entitled “Snow” from a new project called ‘Release The Long Ships’ . Ferenc, a friend of the site, has also graciously agreed to and begun working on the artwork for the upcoming Postrockstar site redesign which will be completed later this year. You can be sure that we’ll be keeping an eye on ‘Release The Long Ships’ as well as Rain Catalogue and keeping you up to date with all of the happenings from this Hungarian musician/artist. 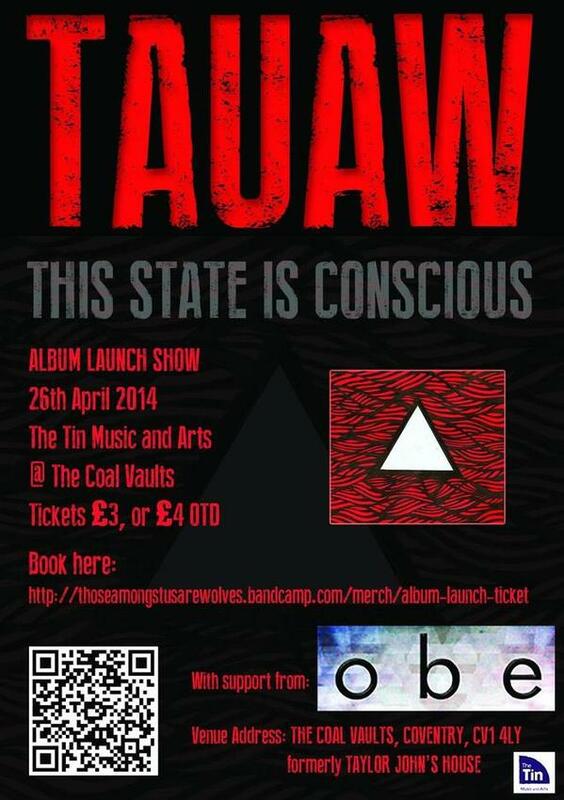 Those Amongst Us Are Wolves are releasing their new album This State Is Conscious, on April 28th, 2014. The album will be available via the band’s bandcamp page found here. Postrockstar will have full review of ‘This State of Conscious’ in the coming weeks. Since 2011, band members Mark Oliver, Tom Brill, Chris O’Connell and Joshua Neal Bate have established Those Amongst Us Are Wolves as an emerging force on the UK’s post rock scene, securing high profile supports for bands such as Nordic Giants, UpCDownC, Iran Iran and Lost In The Riots. Consisting of just four tracks, but clocking in at a mesmerizing 40 minutes, the release of This State Is Conscious sees the band merging influences from across electronica, trip hop and space rock, to deliver a uniquely blended sound. And for those of you reading this from the U.K be sure to check out the band’s facebook event and if possible head on over to their album release show this Saturday. Listen to and download our music (for free!) on Bandcamp or Soundcloud, or follow us on Facebook for up-to-date news about recordings, live shows and whatever else we’re up to at the moment. Linguistically speaking, Larkahl doesn’t mean anything. At least that was the intention – to find a name that sounded beatiful but had no particular meaning in any language, although of course we can’t be sure we haven’t missed some more obscure language that’s out there. A cynic might point out how it’s convenient for a band to choose a name like that because it’s easier to find on Google or stick out among the band names on a show poster. But isn’t there enough cynicism in the world already, anyway? At the time of writing (March 2014), we’ve just recently released our first album. It’s made up of songs from our first several years as a band, both old and new pieces. But since we appreciate the traditional album format, we’ve tried our best to make it a coherent and thought through work rather than just throwing together a bunch of songs. Since we apparently enjoy not only nerding out about pedalboards, but also contradicting ourselves, it’s actually not strictly instrumental but does contain a few spoken word contributions. Not being anywhere close to being able to make a living from our music, this debut album is a work of endless hours of writing, rehearsing, arguing and struggling to find out what we want our music to sound like. So despite recording it with quite a portion of DIY spirit, with zero budget in a free studio, we’ve achieved a recording that we’re immensely proud of. It’s available as a free digital download through our Bandcamp site, or to stream on Soundcloud. 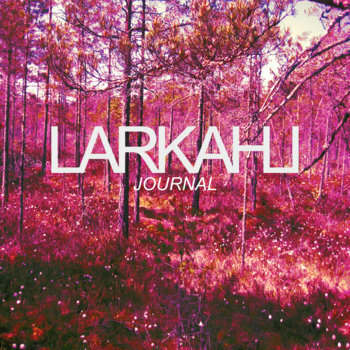 So what’s next in the world of Larkahl? Having forced ourselves to put the finishing touches on our older songs for the debut album, we’ve been inspired to work on completely new material which is already rapidly taking shape for a future release. Judging from the progress so far, it will probably be a little bit shorter and more to-the-point than “Journal”, maybe an EP or mini-album, and will probably also show more post-metal and progressive/mathy influences. We’re making good progress and are aiming for a release sometime in the later half of 2014, but no promises. Only having played a couple of small shows so far, we also really look forward to hopefully getting the chance to present our music to more live audiences. Deep Elm Records is pleased to announce that we are now offering downloads of every album in our catalog (200+) on a Name Your Price (no minimum) basis. Fan support of our artists is a key element in the creation of music that inspires, excites and consoles. It’s all about bands and fans coming together as one and experiencing music’s awesome ability to move the soul. So if you have the means, please show your love by Naming Your Price for a download. If you sincerely do not have any means, in exchange for each download we politely request that you post, share, tag and tweet to tell your friends about the album. Our bands and label depend on your word of mouth. Even if it’s a small act of kindness you perform for a complete stranger (the world could really use more selfless acts of kindness), do something…pay it forward. Be pono. I once had a dream to inspire people with music. Since I’m not a musician myself, I thought I could achieve this by starting a record label. Armed with zero knowledge of the music business, I decided to follow my dream. That was 19 years ago. Last month, Deep Elm released our 200th album…the incredible Save Your Heart by LIGHTS & MOTION. We’ve gone from consigning vinyl 45s via bicycle / backpack to mom and pop record shops in NYC to providing music for Hollywood films…even The Oscars. Minds = blown. We have made our share of mistakes, but when we fell down we got back up. That’s the more important part. We fought for fairness in an industry swimming with sharks. We fought for what we believed in. We found a way to make it work. And when there was no way, we invented one. I know so many people (including many of you reading this message) that have such incredible talents, ideas and visions for a better tomorrow. I encourage you to keep fighting the good fight. With sincere intention, purity of heart, hard work and sacrifice, you can achieve anything. Everything is possible. Dreams do come true. Love what you do. You may be surprised to learn that Deep Elm’s current artist roster has been built solely by bands submitting their music to the label. And we don’t require multi-album agreements. Our bands call Deep Elm home because they want to, not because they have to. We release albums that move our hearts and for no other reason at all. We continue to build a better label – one that operates for glory, not gold. Fairness to the artist and undying integrity in all that we do have been guiding principles at Deep Elm since day one. Deep Elm is part of a threatened breed of true independents that exist for the love of music. Most so-called “indie” labels are, in fact, funded and / or distributed by major record labels and their affiliates. Not Deep Elm. On a completely self-sufficient basis and without any outside support, Deep Elm competes in an industry dominated by corporate giants. We are proud to be 100% independent. It has always been Deep Elm’s intention to get the music of our family of artists into the hands (and ears) of as many people as possible. This announcement is a big step towards that goal. So if you like what you hear, spread the word. And we’ll make sure these bands are there when you need them. We’re not just making music together, we’re making history.